Cavalcade - 4326 horse riding rain coats are now available from Oringi Protection Wear . They feature ventilation panels placed cunningly under the cape to increase breathability. The inside of the butterfly cape is lined with cotton tartan. 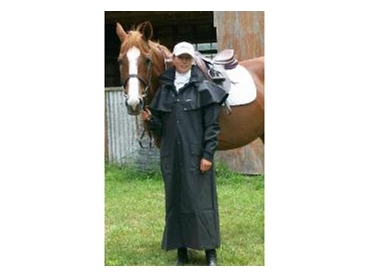 A hood is included with the Cavalcade horse riding rain coats and is easily detached if required. The rear of the rain coats is split and has an extra wide gusset to help cover saddles. In addition, the back length is 125cm. Inside the horse riding wear there are two internal leg straps to make sure it doesn't flap around in the wind while riding. These straps are easily fastened by a simple Velcro system. Hors riders always find extra pockets handy. There are two large pockets on the outside of the Cavalcade rain coats. And on the inside left chest there’s an extra chest pocket.